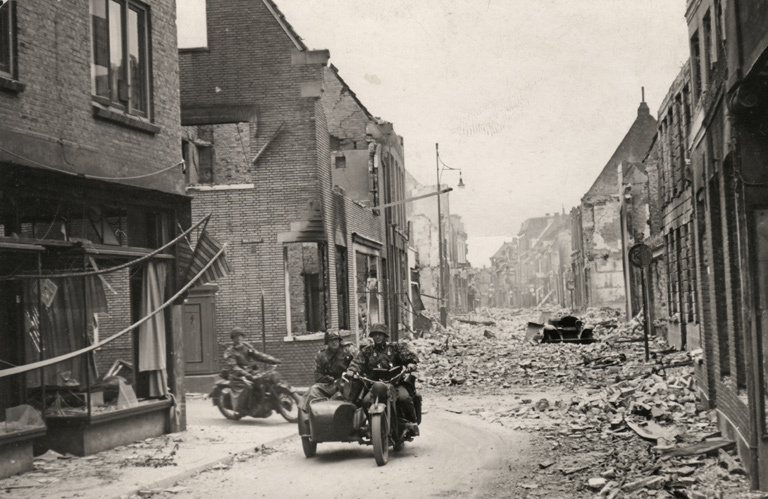 Motorcyclists of the SS-Regiment ‘Der Führer’ in the Hoogstraat in Wageningen driving to the Grebbeberg, 13-15 May 1940 (source). On the morning of May 10th, 1940 the Dutch awoke to the sound of aircraft engines roaring in the sky. Germany had commenced operation Fall Gelb (Case Yellow) and attacked the Netherlands, Belgium, France and Luxembourg, in the case of the Low Countries without a declaration of war given before hostilities. ...especially nowadays. Germans can drive until Lisbon or Helsinki without formalities and without changing the currency. Besides, they dictate the rules to all European countries, either "allied" (UE), or not (Russia or Serbia). Amazing that this was caught on film. World War II still is such a great story after all these years. An endlessly complex event, and your country was certainly in the crosshairs. I agree with Peter, this picture is terrifying to me. The sneak attack and the devastation; it had to be a unending nightmare for those living through it. I would like to think that I can imagine just how terrifying it would be to experience such a situation, but I suspect that I really cannot without actually experiencing it for myself.